As opposed to simple smart contracts, in the classic sense of Bitcoin, that sends money from A to B, dApps have an unlimited number of participants on all sides of the market. Note: These definitions are not set in stone and there are different views on this subject. 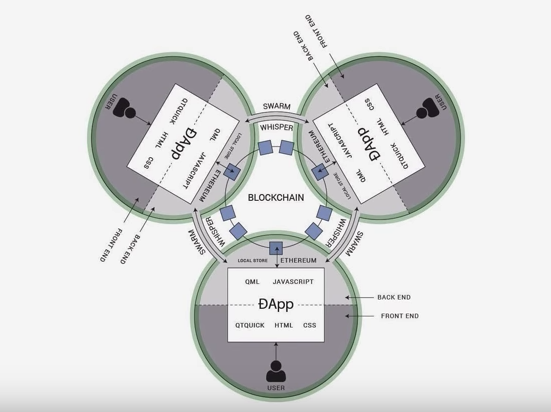 dApps are a ‘blockchain enabled’ website, where the Smart Contract is what allows it to connect to the blockchain. The easiest way to understand this is to understand how traditional websites operate. A smart contract, on the other hand, consists only of the backend, and often only a small part of the whole dApp. That means if you want to create a decentralized application on a smart contract system, you have to combine several smart contracts and rely on 3rd party systems for the front-end. Illustration of a DApp that uses a blockchain with smart contracts combined with the pillars of Swarm and Whisper. dApps can have frontend code and user interfaces written in any language (just like an app) that can make calls to its backend. Furthermore, its frontend can be hosted on decentralized storage such as Swarm or IPFS. It must operate autonomously, and with no entity controlling the majority of its tokens. The application may adapt its protocol in response to proposed improvements and market feedback, but the consensus of its users must decide all changes. must be cryptographically stored in a public, decentralized blockchain in order to avoid any central points of failure. (Bitcoin or a token native to its system) which is necessary for access to the application and any contribution of value from (miners/farmers) should be rewarded with the application’s tokens. according to a standard cryptographic algorithm acting as a proof of the value, nodes are contributing to the application (Bitcoin uses the Proof of Work Algorithm). A whitepaper is published describing the dApp and its features. This whitepaper can outline the idea for dApp development but also entail a working prototype. Funds are invested into building the dApp and deploying it. Operating under open-source license allows dApps to be open for innovation without restrictions of copyright or patent. Also, by being completely open-source, decentralized applications can operate under the legal model of open-source software. Bitcoin, for example, uses the MIT open-source software license. Ethereum intends to create a protocol for building decentralized applications. Ethereum provides developers with a foundational layer: a blockchain with a built-in Turing-complete programming language, allowing anyone to write smart contracts and decentralized applications where they can create their own arbitrary rules for ownership, transaction formats, and state transition functions. In general, there are three types of applications on top of Ethereum. providing users with more powerful ways of managing and entering into contracts using their money. such as online voting & decentralized governance that are not financial at all. For example, a very desirable application is a smart contract that hedges against the volatility of ether with respect to the US dollar by using the data feed from, e.g., NASDAQ. A contract stating the name of the owner of a land title can be added to the Ethereum network but not modified or removed. Anyone can register a name with some value, and that registration then sticks forever. A virtual entity that has a certain set of members or shareholders who, perhaps with a 67% majority, have the right to spend the entity’s funds and modify its code. The members would collectively decide on how the organization should allocate its resources.